Fine, American roadracing has lost a little of the pizzazz it enjoyed there for a while, but the racing itself is as gnarly as it ever was, and the lack of huge throngs of Spaniards and Italians with smoke grenades makes many MotoAmerica rounds a much nicer place to hang out in the park for a weekend. Case in point, Road Atlanta, scene of this weekend’s opening round. See JD Beach bring the heat on his new Attack Performance R1, against defending champ factory Monster Yamaha guy Cameron Beaubier and the everpresent Tony Elias on the Yoshimura Suzuki. Sprinkle in a few BMWs, Kyle Wyman’s Ducati Panigale, and great racing is bound to ensue. Live or very close to it, on Fox Sports 2, Saturday and Sunday, at 2:30 EST. There’s nothing better than a fresh start and 125 riders and their teams will get that new beginning this weekend at Michelin Raceway Road Atlanta when the flag drops on the 2019 MotoAmerica season, April 5-7, with the Suzuki Championship at Road Atlanta. Nobody has any victories, points, mechanical DNFs or crashes. Everyone, at this point in time, is equal. The season starts now. Headlining the opening weekend of racing is the start of the 2019 MotoAmerica EBC Brakes Superbike Championship, the first of 10 rounds of what should be the most thrilling season to date. Leading the ultra-competitive field into the scenic racetrack in Braselton, Georgia, is three-time and defending MotoAmerica Superbike Champion Cameron Beaubier, who is hoping for a better start to his season than a year ago. Last year, Beaubier crashed in race one and remounted to salvage seven points, then rebounded to finish second in the downpour of race two. The bigger issue for Beaubier and the rest of the Superbike field is the fact that Toni Elias won both races to start his title defense in the best possible manner. 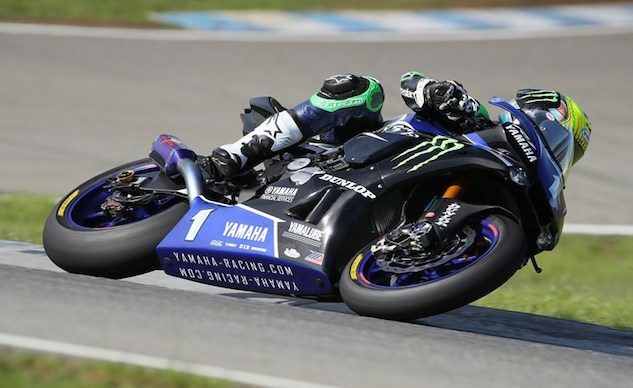 Beaubier and Elias start the season as the odds-on favorites to battle for the title again since those two have won all four of the MotoAmerica Superbike titles (Beaubier in 2015, 2016 and 2018; Elias in 2017). The two are back with their same teams: Beaubier will line up on his Monster Energy/Yamalube/Yamaha Factory Racing YZF-R1 while Elias returns on his Yoshimura Suzuki GSX-R1000. While Beaubier and Elias find themselves in the comfortable position of returning to their existing teams, that’s not the case for Josh Herrin. 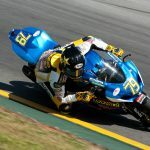 Herrin, who competed at Road Atlanta last year on his trackday practice bike when the Attack Performance race hauler broke down en route to the track, will join Elias on the Yoshimura Suzuki team for the coming season. Herrin finished third in last year’s title chase, winning two races on the Attack Performance/Herrin Compound Yamaha YZF-R1. Beaubier’s teammate, meanwhile, is again Garrett Gerloff, the Texan returning for his sophomore season in the EBC Brakes Superbike Championship. Gerloff ended his rookie season of Superbike racing in fifth place in the title chase. The list of those hoping to beat the four factory riders begins with Westby Racing’s Mathew Scholtz, the South African who had a great start to his season a year ago in the team’s home race. Scholtz finished second to Elias in race one and third behind Elias and Beaubier in race two on his Yamaha YZF-R1. The third Suzuki GSX-R1000 in the EBC Brakes Superbike Championship will be ridden by M4 ECSTAR Suzuki’s Jake Lewis. Lewis was fifth in race one last year and crashed out of race two. He put together a solid season, however, and ended up sixth in the title chase. Seven Yamaha YZF-R1s will line up at Road Atlanta and JD Beach will be on one of them, the two-time Supersport Champion making his MotoAmerica Superbike debut on the new-look Attack Performance Estenson Racing Yamaha. That Stanboli guy builds some fast motorcycles. 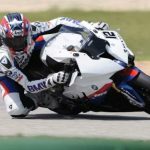 Four BMWs are entered for the season opener with Scheibe Racing’s Jake Gagne leading the charge on his S1000RR after a season of World Superbike racing. Gagne, who suffered a broken lower leg in an off-season training crash, will be joined on BMWs by Canadians Samuel Trepanier and Michael Leon, along with Georgia’s own Geoff May. Team owner/racer Kyle Wyman will be the lone Ducati rider in the race as he makes his much-anticipated debut on the Ducati Panigale V4R in his KWR team. Wyman finished eighth in last year’s championship on his Yamaha YZF-R1. The only Kawasaki ZX-10R on the grid will be ridden by FLY Racing/ADR Motorsports’ David Anthony who, like Wyman, owns the team on which he races. The class structure for the 2019 MotoAmerica Series mirrors last year with five classes (EBC Brakes Superbike, Supersport, Liqui Moly Junior Cup, Twins Cup and Stock 1000). The Supersport class is wide open as the only two men to take titles in the class (Beach and Gerloff) have moved on to the Superbike ranks and RiCKdickulous Racing’s Hayden Gillim is the only rider in the field with a Supersport victory. Gillim won four races last year en route to second in the title chase behind Beach. Still, the list of those expected to give Gillim a run for his money include former World Superbike and World Supersport racer PJ Jacobsen. Jacobsen will be aboard the Celtic HSBK Yamaha YZF-R6. Eyes will also be on a pair of 16-year-olds making their class debut – former KTM RC Cup and Liqui Moly Junior Cup Championship runner-up Cory Ventura (Omega Moto) and Red Bull Rookies Cup racer Sean Dylan Kelly (M4 ECSTAR Suzuki). The Liqui Moly Junior Cup will also grid up without its champion and the top five from last year’s series, which means that it will also be a wide-open affair. On paper, the class should be led by three-time KTM RC Cup winner Jackson Blackmon and Liqui Moly Junior Cup race winner Kevin Olmedo, but those two will also face challenges from the likes of MotoAmerica newcomer Dominic Doyle (from South Africa), Jamie Astudillo, Dallas Daniels and Damian Jigalov, to name a few. Like the EBC Brakes Superbike class, Supersport and the Liqui Moly Junior Cup, the Twins Cup will also race twice over the course of the weekend. That’s a first for the Twins Cup as it will switch off with Stock 1000 from event to event with either two races or just one. 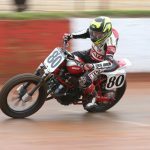 The Twins Cup sees its champion coming back for more with Chris Parrish leading 38 other riders into the Road Atlanta round. Parrish should expect a challenge from Liqui Moly Junior Cup Champion Alex Dumas as well as the men who challenged him the most last year – Jason Madama and Kris Turner. Stock 1000 Champion Andrew Lee and his Franklin Armory/Graves Kawasaki are up against the likes of Weir Everywhere Racing BMW’s Travis Wyman, Tuned Racing Yamaha’s Chad Lewin, Team Norris Racing’s Michael Gilbert and more as the class has swelled to 21 entries for the season opener. With practice and qualifying taking place on Friday, action begins on Saturday with the EBC Brakes Superbike Superpole session at 11:15 a.m. The first race is race one of the Liqui Moly Junior Cup at 1:10 p.m. followed by Supersport race one at 2 p.m. The first EBC Brakes Superbike race is at 3 p.m. and the Twins Cup ends the opening day with its 4 p.m. race one. Sunday’s racing begins with the Liqui Moly Junior Cup race at 1:10 p.m., followed by Supersport at 2 p.m., the second EBC Brakes Superbike race at 3 p.m. and the first Stock 1000 race at 4 p.m. The weekend concludes with the second Twins Cup race at 4:45 p.m. In addition to the on-track action, the Suzuki Championship at Michelin Raceway Road Atlanta will feature a family friendly carnival and Family Fun Zone, the Globe of Death Thrill Shows, Stunt Shows, mini moto demonstrations and the Dunlop Hot Pit Walk and Paddock Autograph Sessions with the stars of MotoAmerica. As the 2019 season begins, the winningest rider in the EBC Brakes Superbike class is Cameron Beaubier. Beaubier has won 32 AMA Superbike races in his career, a win total that puts him in a tie for third on the all-time win list with Miguel Duhamel and behind only Superbike legends Mat Mladin (82) and Josh Hayes (61). Toni Elias has 25 wins to his credit, and he is already sixth on the all-time list and just three behind Ben Spies. The other MotoAmerica Superbike race winners on the 2019 entry list are Josh Herrin (six wins) and Mathew Scholtz (two wins). As for manufacturers, Suzuki is the leader in Superbike wins with 203 after eclipsing the 200-win mark last year. Honda is next with 116 class wins with Yamaha third on 112 victories. The very first AMA Superbike race at Michelin Raceway Road Atlanta was held in 1980 and that race was won by four-time World Champion Eddie Lawson. The EBC Brakes Superbike grid will feature riders from seven states and four countries. California (2), Georgia (2), Kentucky (2), New York (1), New Hampshire (1), Washington (1), Texas (1) are all represented with the international riders hailing from South Africa (2), Canada (2), Spain (1) and Australia (1). Pole position at Michelin Raceway Road Atlanta last year went to Westby Racing’s Mathew Scholtz, the South African lapping the 2.55-mile racetrack at 1:24.067 during Superpole. That lap was just .096 of a second faster than Cameron Beaubier with Toni Elias completing the front row in third. Race one of the EBC Brakes Superbike class last year was won by Yoshimura Suzuki’s Toni Elias over Scholtz and Garrett Gerloff. The fastest lap of the race was set by Scholtz with a 1:25.059 on the third of 21 laps. Scholtz finished 5.123 seconds behind Elias with Gerloff another 7.8 seconds behind in third. Race two was held in a rainstorm and was again won by Elias, this time over Cameron Beaubier with Scholtz finishing third. The fastest lap was set by Elias with a 1:33.907. JD Beach got his Supersport Championship winning season off to a good start last year at Road Atlanta with a win in the first race but by just .223 of a second over Hayden Gillim. Cory West was third. Gillim, however, dominated the wet race on Sunday, besting Beach by 11.79 seconds with Ashton Yates finishing third in just his second career Supersport race. Beach earned pole position for last year’s Supersport race with a lap of 1:29.156. Alex Dumas and Ashton Yates split wins in last year’s two Liqui Moly Junior Cup races. Sean Ungvarsky was third and second in the two races with Jamie Astudillo becoming the first female in MotoAmerica history to land on the podium. She was third in race two. Dumas earned pole position for the first-ever Liqui Moly Junior Cup with a lap of 1:43.486. The first-ever Twins Cup race last year was won by Chris Parrish who would also end up earning the debut class championship. The first-ever Stock 1000 race last year was won by Travis Wyman over the rider who would end up earning the debut class championship – Andrew Lee. The Twins Cup entry list for the season opener is up 333 percent over a year ago – from nine entries in 2018 in its debut to 39 entries in season two. The Stock 1000 class also sees huge gains with entries up 81 percent over last year’s opener at Michelin Raceway Road Atlanta. The Suzuki SV650 remains the most popular choice of motorcycle for the Twins Cup Series with 26 of the SVs entered in the series opener. Yamaha is next with 12 of the FZ-07/MT-07s on the entry list and there is a lone Ducati Monster 797 that will be ridden by veteran Michael Barnes and fielded by the Quarterley Racing team.